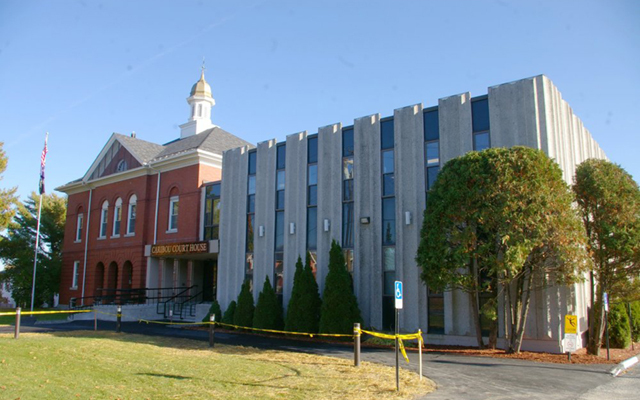 The following cases were heard under the Aroostook Criminal Docket at the Caribou Courthouse during the month of December 2018. CARIBOU, Maine — The following cases were heard under the Aroostook Criminal Docket at the Caribou Courthouse during the month of December 2018. Ralph D. Levesque, Jr., 31, Presque Isle: robbery, 14 days in jail, probation revoked. Brandon Green, 23, Mapleton: probation violation, six months in prison, probation revoked. Kyle Rajaniemi, 31, Fort Kent: unlawful possession of scheduled drug, $800 fine. William Harrison lll, 37, Caribou: gross sexual assault, dismissed; unlawful sexual contact, dismissed; sexual misconduct with a child under 12 years, dismissed. Micah G. Lawlor, 43, Merrill: probation violation, nine months in jail, probation partially revoked. Jessie A. Case, 33, Mars Hill: probation violation, six months in jail, probation partially revoked. Jerald Scheurwater, 31, Caribou: probation violation, nine months in jail, probation revoked. Dwayne M. Bouchard, Jr., 61, Caribou: probation violation, 12 months in prison, probation revoked. Macie Jones, 26, Caribou: unlawful trafficking in scheduled drugs, $500 fine, 42 months in prison all but 15 months suspended, two years probation, $120 restitution. Noraleen A. Easler, 60, Fort Fairfield: domestic violence criminal threatening, dismissed. Ashley Lopez, 29, Caribou: theft by unauthorized taking or transfer, priors, 15 months in jail all suspended, two years probation. Jeffery Trombley, 57, Woodland: probation violation, probation partially revoked, no sentence imposed. Eric M. Condon, 32, Easton: operating while license suspended or revoked, prior, $500 fine. George D. Tamburello ll, 32, Caribou: unlawful trafficking in scheduled drugs, $500 fine, 30 months in prison all but 12 months suspended, two years probation, $50 restitution. Eric A. Frazier, 32, Caribou: unlawful trafficking in scheduled drugs, $600 fine, two years in prison all but 190 days suspended, two years probation, $30 restitution. Bayleigh E. Voisine, 28, Mapleton: operating while license suspended or revoked, prior, $500 fine, seven days in jail; violating condition of release, seven days in jail. Larry D. Drost, Jr., 30, Caribou: assault, $300 fine, 20 days in jail. Jasmyn B. Berz, 28, Caribou: false public alarm or report, $300 fine. Joey E. Thibodeau, 48, Connor Twp: operating while license suspended or revoked, prior, dismissed; operating while license suspended or revoked, prior, $500 fine. Jerald E. Scheurwater, 31, Caribou: domestic violence assault, 11 months in prison all suspended, two years probation. Katrina Lank, 44, Caribou: theft by unauthorized taking or transfer, $200 fine. Ciarra Doody, 33, Caribou: unlawful possession of scheduled drug, dismissed. Larry D. Drost, Jr., 30, Limestone: harassment by telephone, six months in jail all suspended, administrative release sentence one year; violating condition of release, six months in jail all suspended, administrative release sentence one year. Jessica Borst, 27, Caribou: aggravated assault, dismissed. Bayleigh Voisine, 28, Mapleton: violating condition of release, seven days in jail. Jessica M. Jones, 28, Presque Isle: violating condition of release, two days in jail. Robert D. Blaisdell, 29, Caribou: possessing sexually explicit material of minor under 12, dismissed; possessing sexually explicit material, $500 fine, 364 days in jail all but 45 suspended, one year probation. Derek Bosse, 33, Limestone: terrorizing, $250 fine; driving to endanger, dismissed. Bayleigh Voisine, 28, Mapleton: violating condition of release, 10 days in jail. Matthew L. Jandreau, 31, Stockholm: operating while license suspended or revoked, prior, $500 fine; violating condition of release, dismissed. Warren York Jr., 48, Mapleton: unlawful possession of scheduled drug, $400 fine. Dagon Rossignol, 24, Caribou: displaying fictitious vehicle certificate, filed on $100 costs. Christopher B. Tuttle, 39, Washburn: attaching false plates, $100 fine. Pamela Gervais, 62, Caswell: domestic violence assault, 180 days in jail all suspended, two years probation. Brittany Rose Cote, 29, Caribou: criminal mischief, filed on $100 costs. Bruce F. Arsenault, 39, Boothbay: unauthorized subpermittee hunting moose, $200 fine. Vincent Anderson lll, 31, Limestone: attaching false plates, $100 fine. Austin R. Cyr, 21, Caribou: attaching false plates, $100 fine. Keith Hall, 54, Windsor: violation of rule, moose zone, $300 fine. Troy R. Gadaire, 35, Caribou: operating while license suspended or revoked, $250 fine. Jonathan L. Rodriguez, 21, Caribou: theft of services, $100 fine. Timothy P. Rooney, 34, Easton: operating while license suspended or revoked, dismissed. Devin E. Delisle, 33, Caribou: theft by unauthorized use of property, 10 days in jail; operating while license suspended or revoked, $250 fine. Kelly L. LaPointe, 40, Caribou: allowing dog to be at large, dismissed. Devon Maynard, 19, Presque Isle: minor consuming liquor, $200 fine. Herschell Higgins, 59, Presque Isle: entering or causing a projectile to enter a place illegally, $100 fine. Warren Bell, no date of birth listed, Presque Isle: entering or causing a projectile to enter a place illegally, $100 fine.